This is definitely a winter dish but I guess if you make it spicy enough you can probably enjoy it during summer too. Anyway, I am positive nobody cares about my stories so I will get right down to it. I think this is the best beans stew to date, as far as I’m concerned, and since I am not a chili fan, I loaded this dish with a lot of… awesome pork. Now, you can go buy two cans of precooked navy beans (about 14oz/400g each) or boil to death your own fresh batch of beans before you start making the stew. Since I don’t like investing in cooking more time than necessary, I went for the precooked kind. Start with your veggies, chop everything and get caramelizing; add some oil or lard if you feel enthusiastic to a medium size pan and start with the onion. When it is almost fried to your taste add garlic and then everything else in order . Don’t just throw everything in there all at once, make sure everything is cooked/caramelized properly but not burned, before you add the tomato paste. So the order is onions, garlic, carrots, red sweet pepper and in the end tomato paste… yes, pour it over the veggies, add thyme, salt, pepper, cumin; stir and cook for 3-5 minutes then set aside and focus on meat. I used a couple of cabanos sausages but you can use your imagination here in case you can’t find any… and some big fat bacon, not the one already sliced, boring and flavored but the real kind, barely smoked and in one big piece. Cut some generous slices from your bacon , thick enough so you can definitely enjoy it and fry it in a separate pan for few minutes along with sausages; don’t cook them completely. This is the final stretch now. Place your veggies into a large saucepan along with the beans and a couple of bay leaves, add water to barely cover everything, cook on medium-low for about 15-20 minutes then add bacon and sausages and boil until it is greatly reduced. This usually happens within the next 10 minutes but you can continue until you reach the desired thickness. So I guess you are done but before you try it go find yourself a big jar with pickled red pepper (marinated, whatever) because it is the perfect complement to this dish. If you cannot find it at your local grocery store find a Polish store, they are bound to have it. Enjoy! Chop your veggies in cubes as small as possible; in a medium size frying pan add 1 tbsp of vegetable oil or lard and cook your veggies for few minutes. First caramelize onion, but not completely; add garlic over and cook for another 3-5 minutes on medium heat. Next add carrots over both onion and garlic and cook for another 5 minutes or so, use common sense and if you need some more oil go for it but not too much. Finally add red sweet pepper in the same pan and stir for another 5 minutes. Pour tomato paste over veggies and mix and cook 2-3 minutes; add thyme, cumin, pepper and set aside. Cut your bacon and sausages in generous pieces and fry them in a medium size frying pan just to give them a bit color, don't overcook. 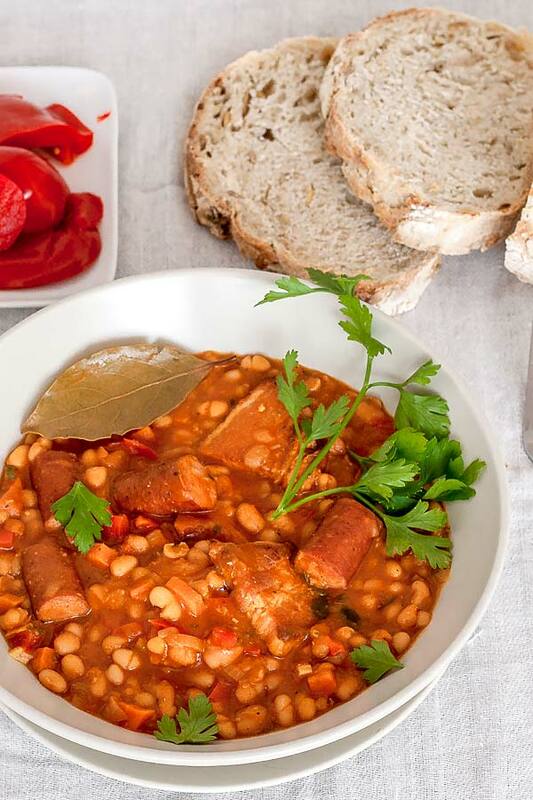 Place your veggies into a medium size saucepan along with the beans and a couple of bay leaves, add water to barely cover everything, cook on medium-low for about 15-20 minutes then add bacon and sausages and boil until it is greatly reduced. This usually happens within the next 10 minutes but you can continue until you reach the desired thickness.